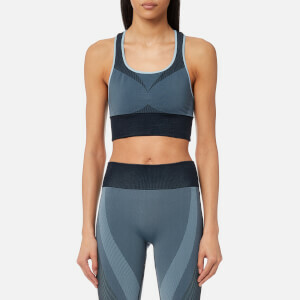 Made by Los Angeles designed, London-made label, Varley, the ‘Willard’ sports bra provides support and compression during runs or workout sessions. Crafted from seamless fabric, the sports bra will adapt to your body without being uncomfortably tight. A wide, elasticated underband offers additional coverage and support. The bra is detailed with a round neck and back mesh panels for added ventilation. Complete with signature branding to the hem.